At the 2017 American College of Rheumatology (ACR) Annual Meeting, a session titled “Holy MACRA! How to Survive and Thrive in the New Era of MACRA, MIPS, and APMs” was held to discuss the implications of this program. 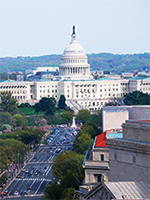 Washington, DC—In late January 2017, experts congregated on Capitol Hill on behalf of the American College of Rheumatology (ACR) and the Arthritis Foundation to hold a congressional briefing titled Arthritis 101, according to a press statement by the ACR.